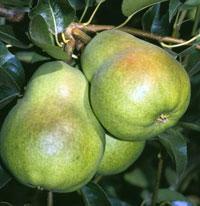 Pears remain the second most important agricultural commodity in the Lake County. The diversity of crops capable of being produced economically in the county strengthens the local farming industry and allows the existence of many auxiliary businesses employing local people. Agriculture and its pleasing rural character complement the many natural scenic attractions in Lake County. Together they form the basis for our local tourist industry. Trends toward reducing the use of pesticides in agriculture have led growers to introduce non-chemical methods such as pheromone mating disruption for the control of codling moth, the principal pest of pear and apple. Local growers and researchers have received two statewide awards from the California Department of Pesticide Regulation for their efforts in reducing pesticide use. In addition to coddling moth, other important diseases and pests attacking commercial orchards include fire blight, pear scab, pear psylla, oriental fruit moth, pear rust mite and pear blister mite. Unfortunately, these newer “soft” pest management programs open commercial orchards to potential attack from pests multiplying on nearby unmanaged trees. Codling moth mating disruption fails when mated female moths fly in from nearby unmanaged trees, leading to resumed spraying. These sprays can then reduce beneficial species capable of controlling pear psylla and some kinds of mites, thereby requiring even more spraying. Growers must produce clean fruit in order to compete in the local marketplace and abroad. Unmanaged trees negate much of the progress the pear industry has made toward achieving reduced pesticide use. By participating in the Unmanaged Apple and Pear Tree Outreach Program (UAPTOP), growers and homeowners can work together to assure that local fruit continues to be produced with minimal pesticide use. A healthy pear industry will help preserve the economy and keep Lake and Jackson counties the beautiful and special places that they are. Controlling fruit pests is not only the right thing to do, it’s the law. The California Food and Agricultural Code (Chapter 7) lists the circumstances making a neglected plant a public nuisance and authorizes the county agricultural commissioner to abate the nuisance. Applicable Lake County ordinances (#466, #743) require that pear psylla be managed and fire blight infections be immediately removed. In order to maintain effective non-chemical control of codling moth, a new ordinance (#2895) has been adopted. This requires pear and apple trees within ¼ mile of commercial orchards to be managed or the county may require removal of the crop or trees at the owner’s expense. If you have apple or pear trees on your property and you are within ¼ mile of a commercial orchard, you have many resources to help you manage your trees. 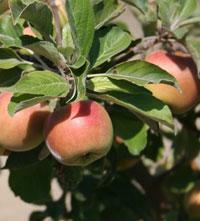 (Click here to find out your proximity to commercial orchards.) If you can’t find what you’re looking for on this web site, please contact the University of California Cooperative Extension at 883 Lakeport Blvd., Lakeport, CA 95453, (707) 263 6838. 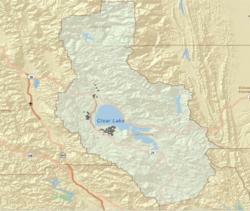 The Interactive Mapping Website provides an online map very similar to Google Map. Individuals with apple and/or pear trees can use the map provided by UAPTOP to find out if their trees are close enough to cause a risk to commercial orchards. It is very simple. Just type in your address and the map service will calculate the potential risk. The University of California offers a multitude of resources to guide you in managing your backyard apple and pear trees. Free UC Agricultural and Natural Resources (ANR) publications can be downloaded from the web or obtained at your local UC Cooperative Extension (UCCE) office. More extensive manuals for the serious home orchardist can be purchased through the online ANR Catalog or at the UCCE office. For information on how to manage individual pests - provided you know which pest you are dealing with - download free “Pest Notes” from the UC Integrated Pest Management website. The following web pages will help you identify specific pests. Each of the above pages lists the most common insect pests and diseases of the particular fruit. Click on the name of the pest to reveal photos. These pages also include management guidelines specifically for the home orchardist. Of course, you can also contact the UC Master Gardeners at (707) 263 6838, for help with identifying and managing pests.